Jack and I will basically be passing Mr. E in the airport today. We leave on a little college-related trip at about the same time Mr. E gets home from a business trip. I'll admit that I've never been one of those wives to pack the freezer with casseroles for when I'm out-of-town. A. I never go anywhere, and B. there's always a box of taquitos available. 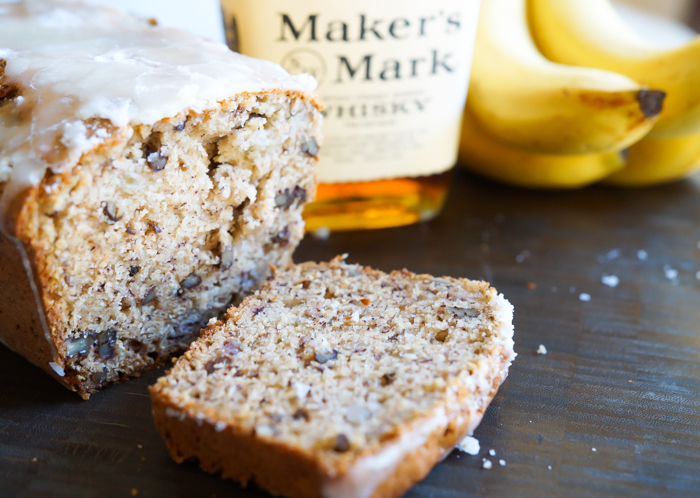 Anyhoo...yesterday, I decided to break into Mr. E's Maker's Mark (not to drink it) and make some bourbon banana bread for him to have while we're gone. 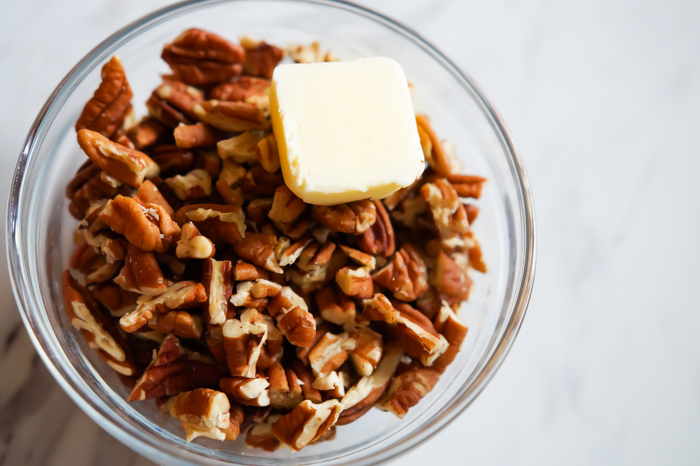 The bread starts with buttered pecans. That's right. We're toasting the pecans in butter before adding them to the batter. Try not to eat them all first. 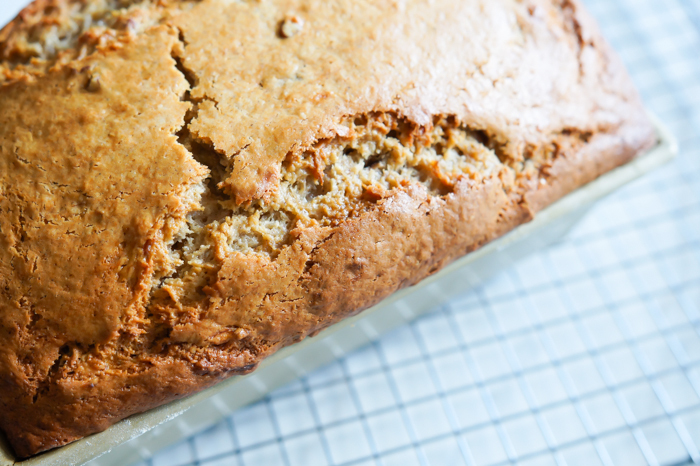 The bread is adapted from one in the King Arthur Flour Baker's Companion. I added bourbon. I also added a bourbon glaze. 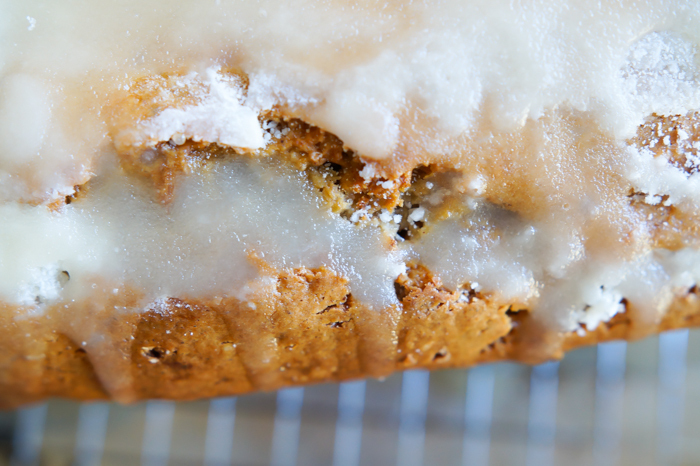 A POTENT bourbon glaze. 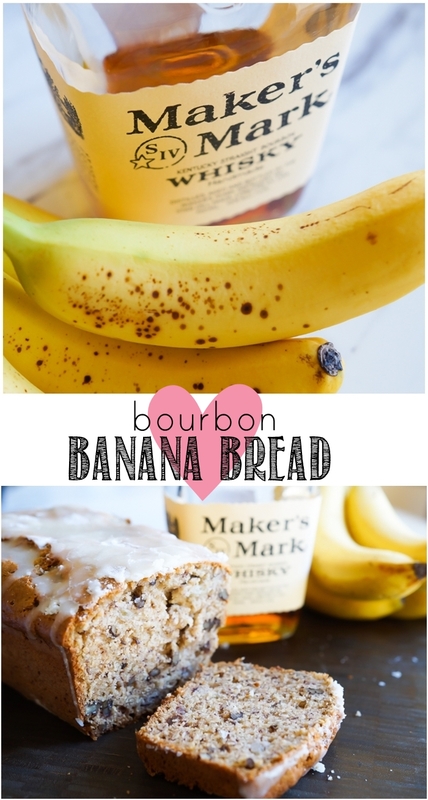 The bourbon in the bread just brings out the banana flavor, but the glaze...the glaze is bourbon-y. If you're making this for kids, you might want to omit it. Serve the bread straight up or toasted with a soft spreadable butter, or pan-fry it in a little butter and top with vanilla or butter pecan ice cream. Y'all....I just had an idea for bourbon cream cheese. I think it needs to happen. Stay tuned. In the meantime, make the bread. Grease and flour a loaf pan. Preheat oven to 350. In a small skillet, melt the butter. Add the pecans and cook, stirring frequently until toasted and fragrant. Set aside. 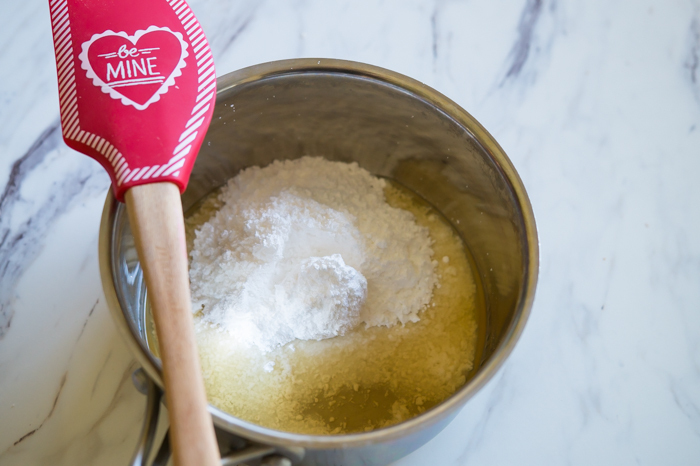 Whisk the flour, baking soda, baking powder, salt, cinnamon, and nutmeg together. After whisking, sift the mixture and set aside. With an electric mixer, beat the eggs, sugar, and oil until blended. 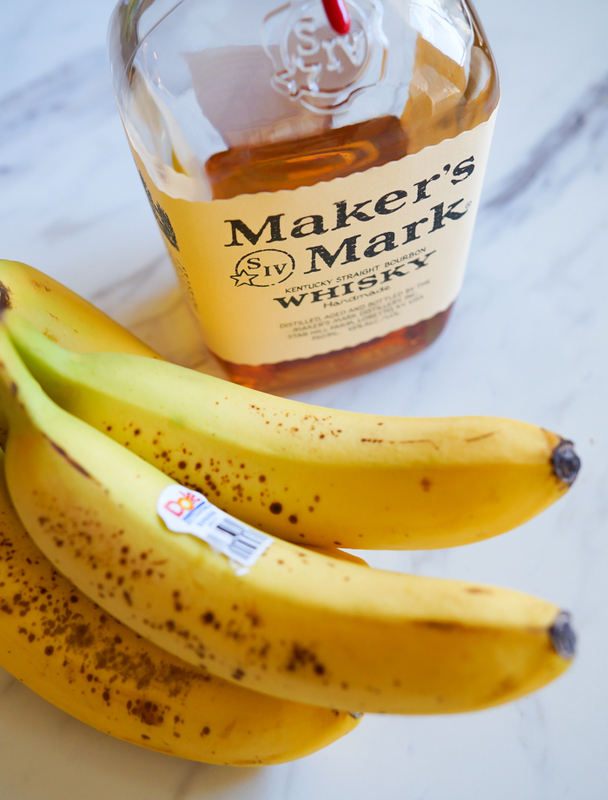 Add the bananas, vanilla, and bourbon; mix until combined. Add the flour mixture all at once, mixing just until incorporated. Stir in the sour cream and buttered pecans. Bake for 55-75 minutes (depending on size of loaf pan) or until a toothpick inserted in the center comes out clean. Run a knife along the edges of the pan and remove the bread, placing on a wire cooling rack set over a rimmed cookie sheet. In a small saucepan, heat the powdered sugar, water, and bourbon until boiling. Reduce heat and simmer and stir for a few minutes until the sugar is dissolved and the mixture has thickened slightly. 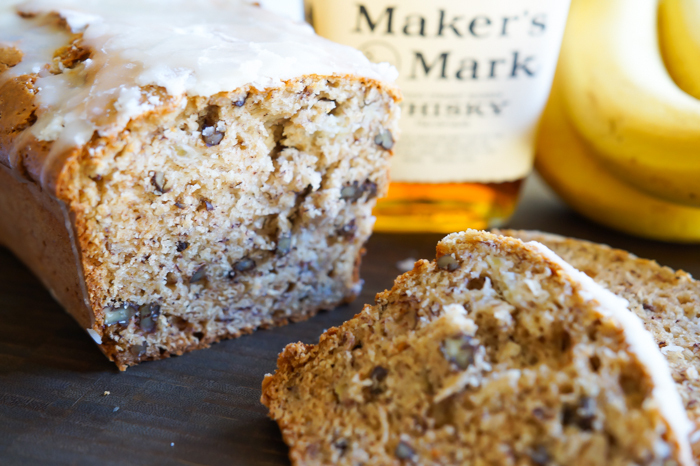 Poke holes in the top of the banana bread and quickly pour the glaze over the warm bread. Or, you know, c - your husband ought to be capable of fending for himself! Yes...he's clearly great at doing that since, like I said in the post, I never leave meals when I'm gone. He's not incapable. But, every so often, I think it would be a nice, caring thing to do since he's my husband and making him happy makes me happy. ♥ He does all sorts of thoughtful things for me. Can you really taste the bourbon? One tablespoon doesn't sound like much.